Newly redesigned and engineered to satisfy virtually any storage need. Top organizers enable small parts organization. Latch with geometric lock for smooth and easy use. New elegant design with sturdy robust appeal. Pad eye lock, enables to lock the toolbox. Top recesses for screws and washers. Tool tray with handle and enabled side access for flexible storage solutions. Made of heavy-duty canvas fabric. Plastic reinforced zipper. Wide bottom to sit upright. Size: 10 in. W x 3 in. D x 8 in. 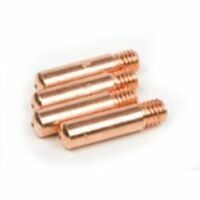 H. MIG contact tips are compatible with "Forney" (00306 and 00308), "Tweco", "Binzel" or "Clarke" MIG guns. It is precision machined. 4-pack. MIG contact tips are compatible with "Forney" (00306 and 00308), "Tweco", "Binzel" or "Clarke" MIG guns. It is precision machined. 4-pack. MIG contact tips are compatible with "Forney" (00306 and 00308), "Tweco", "Binzel" or "Clarke" MIG guns. It is precision machined. 4-pack. MIG contact tips are compatible with "Forney" (00306 and 00308), "Tweco", "Binzel" or "Clarke" MIG guns. It is precision machined. 4-pack. Replacement MIG contact tip for "Hobart Handler" 135, 140 ("Forney" 00355), 175 and 187 ("Forney" 00356) and "Ironman 210" ("Forney" 00362) and 250 ("Forney 00361). 3-pack. Replacement MIG contact tip for "Hobart Handler" 135, 140 ("Forney" 00355), 175 and 187 ("Forney" 00356) and "Ironman 210" ("Forney" 00362) and 250 ("Forney 00361). 3-pack. Replacement MIG contact tip for "Hobart Handler" 135, 140 ("Forney" 00355), 175 and 187 ("Forney" 00356) and "Ironman 210" ("Forney" 00362) and 250 ("Forney 00361). 3-pack. For Hobart, Handler 135, 140 (Forney 00355), 175 and 187 (Forney 00356), and Ironman 210 (Forney 00362) and 250 (Forney 00361). 3-pack. Two lid organizers for small parts storage - accessible without opening the tool box; built-in pad lock eye for small locks - keeps contents secure; soft, wide rubber coated handle allows for easy and comfortable grip; tote tray inside to store smaller items. Heavy-duty, extra strength 2" wide work suspenders. Adjustable to fit most sizes. Heavy-duty front and rear clips, comfortable elastic rear straps. Heavy-duty, extra strength 2" wide work suspenders. Adjustable to fit most sizes. Heavy-duty front and rear clips, comfortable elastic rear straps. Durable clip hangs on toolbelts, belt loops etc. Carry and organize all miscellaneous parts, tools and accessories. 3 convenient sizes: 9" x 7", 7" x 6" and 6" x 5". Heavy-duty, extra strength 2" wide work suspenders. Adjustable to fit most sizes. Heavy-duty front and rear clips, comfortable elastic rear straps. Mesh windows. Assorted sizes and colors. Brown: 5.7 in. W x 4.8 in. H. Gray: 6.7 in. W. x 5.7 in. H. Black: 8.7 in. W x 6.7 in. H. Heavy-duty, extra strength 2" wide work suspenders. Adjustable to fit most sizes. Heavy-duty front and rear clips, comfortable elastic rear straps. Heavy-duty, extra strength 2" wide work suspenders. Adjustable to fit most sizes. Heavy-duty front and rear clips, comfortable elastic rear straps. Two lid organizers for small parts storage - accessible without opening the tool box; built-in pad lock eye for small locks helps keep contents secure; tote tray. No.10 canvas bag with strong zipper; convenient storage for pliers, wrenches and other tools. Two lid organizers for small parts storage - accessible without opening the tool box; built-in pad lock eye for small locks - keeps contents secure; soft, wide rubber coated handle allows for easy and comfortable grip; nickel metal-plated latches; tote tray inside to store smaller items. Newly redesigned and engineered to satisfy virtually any storage need. Top organizers enable small parts organization. Latch with geometric lock for smooth and easy use. New elegant design with sturdy robust appeal. Pad eye lock, enables to lock the toolbox. Top recesses for screws and washers. Tool tray with handle and enabled side access for flexible storage solutions. Two lid organizers for small parts storage - accessible without opening the tool box; built-in pad lock eye for small locks - keeps contents secure; soft, wide rubber coated handle allows for easy and comfortable grip; nickel metal-plated latches; tote tray inside to store smaller items. One hand operation latch allows opening when other hand is occupied; innovative design with robust structure and large volume; extra-wide soft grip handle for easy lifting; removable tray allows enough space for larger tools to be stored underneath; organizers on top lid for small parts organization. One-handed operation latch that allows for opening when the other hand is occupied; integrated water seal to help protect from water and dust; soft grip handle for easy grip and carrying; V groove on lid suitable for holding pipes and lumber while being worked on. Two lid organizers for small parts storage - accessible without opening the tool box; built-in pad lock eye for small locks - keeps contents secure; soft, wide rubber coated handle allows for easy and comfortable grip; nickel metal-plated latches; tote tray inside to store smaller items. One hand operation latch allows opening when other hand is occupied; innovative design with robust structure and large volume; extra-wide soft grip handle for easy lifting; removable tray allows enough space for larger tools to be stored underneath; organizers on top lid for small parts organization. Keeps fasteners, tools and other equipment close at hand for easy retrieval. The vertical storage design makes it ideal for holding taller tools, batteries and other items. Its heavy-duty construction holds up to regular use and is immune to rust so you can use it out in the rain. Flexible platform allows different combinations; Bi-material handle on top of each unit for easy and comfortable lifting; all units can stack on top of the other, connected with durable side latches; heavy-duty metal latches for rust resistance. Rugged, lightweight ballistic poly fabric; innovative handle design for easy adjustment and carrying; 3 main nail and tool pockets; 7 smaller pockets for pliers, pencils, nail sets, etc. ; metal clip holds all measuring tape sizes; 2" wide web belt with single tongue roller buckle. Top case with integrated carry handle for power tools and small parts; long metal carry handle for easy grip and carrying the tote; heavy-duty design and durable structure; front push-button for easy detaching/attaching of the case to the tote unit; heavy-duty, anti-rust metal latches on top case. Heavy-duty tool box metal walls with protective plastic base and edges; heavy duty metal latches; removable tote tray; integrated saw groove; removable vertical storage divider; easy grip handle; padlock eye provides secure locking. Flexible platform; removable dividers for customized organization of tools and parts; simple shape and proportions for easy access to both hand and power tools; removable, one-hand latches; enable easy connecting/detaching; lid organizer for small parts and accessories. Size: 6" H x 19" L x 12" W.
Poly ripstop / 600d poly material; 5 pockets: 4 exterior (1 with zipper), 12 tool loops interior; steel handle w/foam rubber grip. Size: 12" W x 10" D x 11" H. Large, gusset-style pockets provide extra capacity and easy access, 5-main pockets and inner flat pocket for a variety of tools, nails and parts and steel loop hammer holder and tape measure clip. Pouch handle allows for simple belt adjustments, easy one-hand carrying and convenient on-hook storage, 2-inch wide web belt with double-tongue roller buckle helps keep belt stable. One hand operation latch allows opening when other hand is occupied; innovative design with robust structure and large volume; extra-wide soft grip handle for easy lifting; removable tray allows enough space for larger tools to be stored underneath; organizers on top lid for small parts organization. Heavy-duty poly material cover with slip-resistant spine is durable and easy to carry; full zipper closure keeps loose articles secure; built-in calculator solar power keeps it ready for quick calculations; spring clip holds writing pad and notes in place; multiple pockets and sleeves for business cards, pens, and loose documents. Lightweight, durable, rust proof, plastic construction; telescopic aluminum handle; convenient and compact; folds down flat for storage; 80 lb loading capacity. Flexible platform allows different combinations; all units can stack on top of the other, connected with durable slide latches; removable covered cups for organization of small parts and accessories; removable dividers for organization of drills and bits; ball bearing slides reliable for heavy-duty loads; bi-material handle on top of each unit for easy and comfortable lifting; heavy-duty metal latches for rust resistance. Flexible platform allows different combinations; all units can stack one on top of the other and connects with durable side latches; built in bi-material handle for easy and stable portability; removable tray for quick access to tools that are most used; extra large volume for high tools storage. LoadBear? stretch suspension for comfort. Cell phone pocket fits up to an iPhone? 6. Breathable foam construction to stay cool. Clips to any D ring on most belts. 9 pockets outside and 8 inside to organize a wide range of tools and accessories. Main pocket with web loops to accommodate large handle tools. 13-1/2" x 9" Multi-compartment plastic tray included, stores into middle compartment for easy access to the rest of bag contents. Padded carrying handles and adjustable shoulder strap. Metal tool snap and electrical tape strap. 16"L x 9"W x 9"H.
150 pound capacity hand truck folds down to 2" thick for easy storage; sturdy steel frame with an extra load support plate; integrated single hand lock and release handle with strong composite supports for a wobble free performance; bungee cord included, hand truck is equipped bungee knobs and pre-drilled bungee support holes. Dimensions: 40" H x 15.25" W, 5" wheels. Great for laundry, groceries, sport, school and much more; folds flat to 3" thick; push button telescopic handle; 4 wheel operation; stores any where; smooth rolling; 55 lb capacity; handle extends to 39.5". Tough material combination and embossed logo branding; tough resin combined with gray metal and long lasting branding; tall tool box with a vertical storage unit for organization and easy access; long metal hinge to carry the heavy loads; large metal latches, heavy-duty, strong, rustproof; portable tray for hand tools and small parts; holes ready for inserting a lock for security of your tools; V-groove on top lid for any onsite sawing and adjusting needs. Flexible platform allows different combinations; all units can stack on top of the other, connected with durable slide latches; removable covered cups for organization of small parts and accessories; removable dividers for organization of drills and bits; ball bearing slides reliable for heavy-duty loads; bi-material handle on top of each unit for easy and comfortable lifting; heavy-duty metal latches for rust resistance. Built in Flex-light allows you to use this portfolio indoors and out, in all lighting conditions. Heavy-duty poly material with Sure-Grip spine provides strength and durability. Built in calculator, solar and battery power for quick, accurate calculations. Full zipper closure helps keep notes and documents secure while sleeves and pockets hold business cards, credit cards, pens, pencils and markers. Spring clip that can hold writing pad up to 8-1/2 inch by 11-inch. Tough material combination and embossed logo branding; tough resin combined with gray metal and long lasting branding; tall tool box with a vertical storage unit for organization and easy access; long metal hinge to carry the heavy loads; large metal latches, heavy-duty, strong, rustproof; portable tray for hand tools and small parts; holes ready for inserting a lock for security of your tools; V-groove on top lid for any onsite sawing and adjusting needs. Extra heavy-duty, professional; water seal makes toolbox water resistant; ideal for carrying power tools, hand tools and medium to large items; portable half tray allows room for storage or larger items; V-groove with ruler on top of lid holds materials such as lumber and pipes in place for cutting. Innovative design with robust structure and large volume; telescopic handle for convenient maneuverability and folds down for storage; removable tray allows enough space for larger tools to be stored underneath. Flexible platform allows different combinations; all units can stack on top of the other, connected with durable slide latches; removable covered cups for organization of small parts and accessories; removable dividers for organization of drills and bits; ball bearing slides reliable for heavy-duty loads; bi-material handle on top of each unit for easy and comfortable lifting; heavy-duty metal latches for rust resistance. Durable tool box with integrated organizer for small parts and connectors; extra wide carrying handle makes it easy to transport the box around the jobsite; heavy duty resin design stands up to the toughest daily abuse; top organizer detaches from tool box for added versatility; corrosion resistant latches keep your valuable tools safe and secure in the box; perfect storage solution for mechanics, electricians, maintenance workers, etc. Bag has a double gusset front pocket provides extra capacity and easy access, 4 main pockets, 6 smaller pockets and sleeves for nails or other small tools and web loop for pry bar. The 2" wide web belt with double-tongue roller buckle helps keep belt stable and a patented pouch handle allows for simple belt adjustments and easy one hand carrying. Bag is heavy duty leather with a double gusset front pocket for extra capacity and easy access, 4 main pockets, 6 smaller pockets and sleeves for nails or other small tools and web loop for pry bar. The 2" wide web belt with double-tongue roller buckle helps keep belt stable and a patented pouch handle allows for simple belt adjustments and easy one hand carrying. Box-shaped design prevents tipping. 7" x 5-1/2" multi-compartment plastic tray included to organize small parts. Pockets for drill bits, tips and electrical tap strap. Push button telescopic and lightweight aluminum design; smooth rolling 2 wheel design; stores anywhere - even cramped spaces for the ultimate storage convenience; ergonomic grip and fold away handle; 155 lb load capacity. Durable 4mm thick structural foam box wall gives robust structure to the stand alone units; integrated water seal in every unit for protection of contents and long life for your equipment; metal carrier with adjustable foldable brackets allows tailored configuration; central locking mechanism secures the box to the frame; IP65 rating - water and dust resistant. For use with the dewalt "TSTAK" system; 4 heavy duty wheels; for transporting tools and stored items around the worksite. Durable 4mm thick structural foam box wall gives robust structure to the stand alone units; integrated water seal in every unit for protection of contents and long life for your equipment; metal carrier with adjustable foldable brackets allows tailored configuration; central locking mechanism secures the box to the frame; IP65 rating - water and dust resistant. 21 Multi-use pockets to organize a wide range of tools and accessories. Adjustable, padded shoulder strap with metal hardware. Sturdy metal handle bar with foam grip for easy carrying. Wide open space below handle for easy access to tool carrier's main compartment. 14"L x 11"W x 11"H .
LED light handle can be easily directed at work area or into tool carrier to help identify tools and parts; 3-levels of light output allow adjustment for wide area illumination or close-up work; ergonomic handle design helps reduce stress on hand and wrist; convenient open compartment for power tools and accessories; 22 multi-use pockets to help organize a wide variety of hand tools; padded, adjustable shoulder strap for easy carrying; base pad feet to help reduce wear and abrasion; powered by (2) AAA batteries, included. Removable metal frame partition slides into place to customize tool box to your storage needs. Wide open space below handle for easy access to tool carrier's main compartment. Sturdy metal handle bar with molded foam grip for easy carrying. Multi-use pockets to organize a wide range of tools and accessories. Adjustable, padded shoulder strap with metal hardware. 20"L x 11"H x 11"D. Heavy-duty, extra strength 2" wide work suspenders. Adjustable to fit most sizes. Heavy-duty front and rear clips, comfortable elastic rear straps. Durable 4mm thick structural foam box wall gives robust structure to the stand alone units; integrated water seal in every unit for protection of contents and long life for your equipment; metal carrier with adjustable foldable brackets allows tailored configuration; central locking mechanism secures the box to the frame; IP65 rating - water and dust resistant. The tool bag has 3 levels of light output allow adjustment for wide area illumination or close-up work with a light output of 39 lumens max. There are 28 multi-use pockets inside and 13 outside to help you better organize your tools and the vertical pockets keep tools in sight for quick access. The tool bag has padded web carrying handles and adjustable shoulder straps for comfortable and convenient no-hands transport and a base pad feet to help reduce wear and abrasion. The tool bag holds a multitude of tools and accessories like drills, extensions cords, pliers, screwdrivers, wrench sets, drill bits, testers and much more. Constructed with impact resistant polymers and metal reinforced corners to provide up to 100lbs of weight capacity and ultimate durability in harsh jobsite conditions. Featuring an IP65 rated weather seal to keep out rain and jobsite debris and a metal reinforced top handle. The Milwaukee PACKOUT? tool box is fully compatible with all Milwaukee PACKOUT? modular storage products. Heavy-duty, extra strength 2" wide work suspenders. Adjustable to fit most sizes. Heavy-duty front and rear clips, comfortable elastic rear straps. Features an impact resistant molded base that fully integrates with all PACKOUT? system components. Constructed with 1680D ballistic material and all metal hardware. Designed for ulitmate durability while the included padded shoulder strap and durable over molded handle allows for easy transport. Constructed with impact resistant polymers and metal reinforced corners to provide up to 100lbs of weight capacity and ultimate durability in harsh jobsite conditions. Featuring an IP65 rated weather seal to keep out rain and jobsite debris and a metal reinforced top handle. The Milwaukee PACKOUT? tool box is fully compatible with all Milwaukee PACKOUT? modular storage products. Features an impact resistant molded base that fully integrates with all PACKOUT? system components. Constructed with 1680D ballistic material and all metal hardware. Designed for ulitmate durability while the included padded shoulder strap and durable over molded handle allows for easy transport. This tool bag's LED light can be easily directed at work area or into backpack to help identify tools and parts. The 3 levels of light output allow adjustment for wide area illumination or close-up work and has an output of 39 lumens max. The tool bag has 48 multi-use pockets inside and 9 outside to help organize your favorite tools, parts and accessories. The tool bag can hold a multitude of tools and accessories like drills, extensions cords, pliers, screwdrivers, wrench sets, drill bits, testers and much more. The backpack has large pads on back for extra comfort, padded web carrying handles and adjustable shoulder straps and base pad feet to help reduce wear and abrasion. Collapses to 8" wide for easy storage; securely locks open and closed; 3 levels for holding items; handles feature dual comfort material and 3" swivel wheels with a sleek modern design; constructed of durable, lightweight aluminum with 3" rubber swivel wheels; max load 50 lbs per level; open dimensions: 34" x 15" x 26-1/8"; closed dimensions: 42" x 15" x 8". Do not stand on or ride on; keep hands clear when folding shut; follow maximum weight instructions and do not overload. Large, sturdy telescoping handle extends for fast transport of heavy loads. Magnetic folding zipper top conveniently attaches to telescoping handle for full access to main compartment. 6 multi-use pockets inside and 11 outside to help organize a wide variety of hand tools. Heavy-duty treaded wheels for easy bag movement over rough terrain. Large interior holds most large power tools and accessories. Padded web carrying handles. Features an impact resistant molded base that fully integrates with all PACKOUT? system components. Constructed with 1680D ballistic material and all metal hardware. Designed for ulitmate durability while the included padded shoulder strap and durable over molded handle allows for easy transport. Part of the PACKOUT? Modular Storage System; constructed with impact resistant polymers; 250lgbs. weight capacity; industrial grade extension handle; 9" all-terrain wheels; IP65 rated weather seal; metal reinforced corners; metal reinforced locking point; interior organizer tray; mounting location for the ONE-KEY? TICK?. Built-in organization compartments, convenient lift out carry tray. Metal carrier with adjustable foldable brackets allows tailored configuration; central locking mechanism secures the boxes to the frame; "ToughSystem" cases not included. Weight capacity: Brackets - 176 lbs., Tote plate - 265 lbs., use on stairs - 175 lbs. ; Dimension: 26" L x 37" H x 9" W.